Order Your 2019 LLSA Study Guide Today! You'll Get Full Reprints Of The Original Articles And Gain All The Knowledge You Need, Plus Earn Free CME. 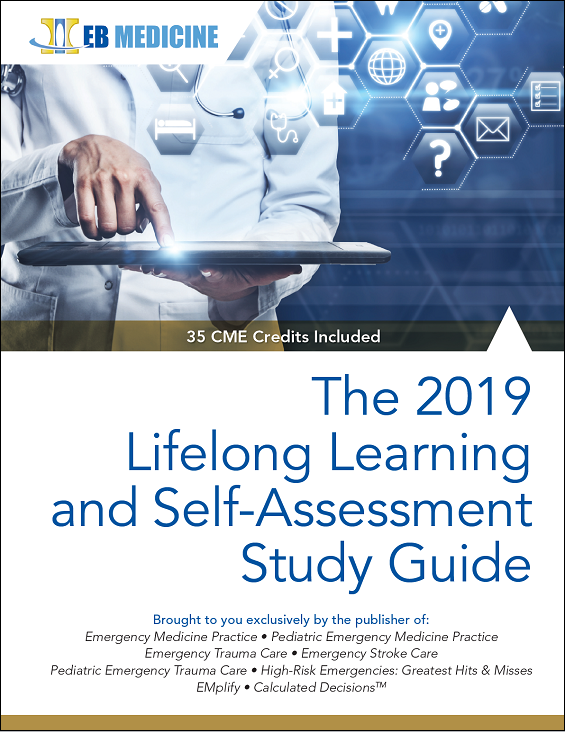 EB Medicine's 2019 LLSA Study Guide is designed specifically to help you gain practical knowledge of the material and to ace the ABEM exam. For each of the readings chosen by ABEM, you receive print and digital tools to help you ace the exam. Both versions include full reprints of the articles, a summary and in-depth discussion of each article, sample questions and answers, and a critique of the article. Plus, you earn 35 AMA PRA Category 1 CreditsTM / ACEP Category I at no extra charge. Specialty CME credits: Included as part of the 35 credits, this CME activity is eligible for 3 Critical Care credits, 3 Ethics credits, 6 Neurology credits, 6 Obstetrics/Gynecology credits, 4 Pharmacology credits, and 3 Trauma credits, subject to your state and institutional requirements. This is my "go to" resource. Appreciate the concise summary but with the article included. Gives me the ease of earning CME's but also the additional information needed to pass the LLSA.